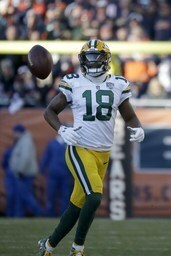 FRISCO, Texas (AP) The Dallas Cowboys have agreed to terms on a one-year contract with free-agent receiver Randall Cobb. The Miami Dolphins are a team to watch with quarterback Josh Rosen after the Arizona Cardinals selected quarterback Kyler Murray first overall on Thursday night. A trade of Rosen isn't imminent, but the Dolphins and Cardinals have been talking, according to NFL Network's Ian Rapoport and Tom Pelissero. The Dolphins have been doing work on Rosen for weeks and are one of the few destinations that would make sense for him. However, the Cardinals won't just give Rosen away and would be fine hanging onto him if they don't receive an acceptable offer. On the flip side, the Cardinals may not get good value for Rosen if he demands a trade. Miami might be Rosen's best chance of seeing decent playing time in 2019, but even there he wouldn't have much fantasy appeal.